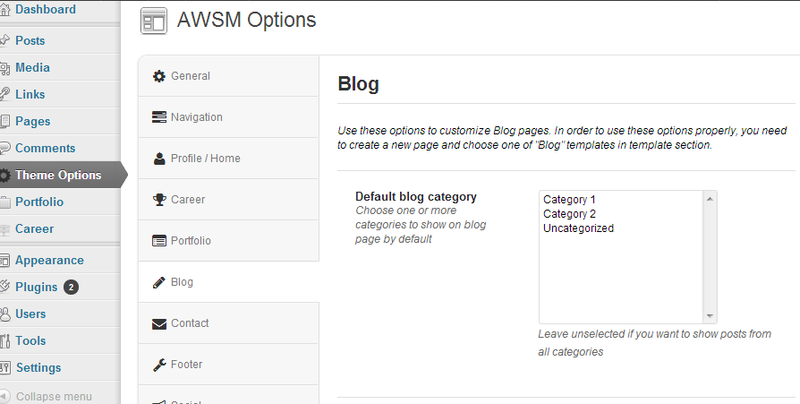 AWSM theme provides plenty of options divided by 10 sections. In most cases, this options corresponds with specific page templates which will be described later in the documentation. In the list below, we will just describe theme options global overview. Almost every specific option is described inline in the Theme Options admin panel. Navigation These are the options for a main switch between one page and standard layout. Profile/Home Profile options affect your home/profile page template which you will probably choose as a landing page(screen). Here you can enter your site name and a tagline, as well as choose up to 8 social icons to show around your logo image. Career Career options corresponds with about/career page template and career custom post type. This options provides ability to fit this page to your needs. Portfolio Portfolio options corresponds with portfolio page template and single portfolio items. Here you can manage styling and display options for both main portfolio page and single portfolios. Blog These options affects blog page template as well as most of the common WordPress templates such as archive, tag, category, search, single, etc… Mostly, these are styling and display options. If you want to display/hide category links, tag links, comments, etc, this is where you can change it. Contact These are the options for contact page template. Here you can change contact form fields and email settings, as well as the settings for Google Map. Footer You can enable/disable footer area here as well as add copyright text. Footer area is using a footer sidebar which is more described in the sidebars section of this documentation. Social This is where you will specify all URLs to your social profiles so you can use them within the theme later. Import/Export This is a nice tool where you can save and backup your theme options. It can be very useful if you want to copy and import your option settings to another site which is using AWSM theme, i.e when moving your site from localhost to live server.